Les Brown is one of the most popular motivational speakers in the world today. 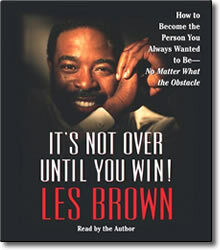 In It’s Not Over Until You Win!, Brown offers a powerful and inspirational plan to help people overcome any obstacle in their lives. Les Brown has been through countless ups and downs, suffering through personal and career crises including the cancellation of his television show and the death of his beloved mother. In this unique audio program, Brown tells you how he rose from those depths and how you can, too. It’s Not Over Until You Win! captures the amazing spirit of Brown’s electric speaking style in a sure-fire empowerment audiobook that will help you take your life to a higher level of satisfaction and fulfillment.